Disney’s “Frozen” has swept the country by storm. Your party will be the talk of the town with the Disney Frozen Bounce Party. 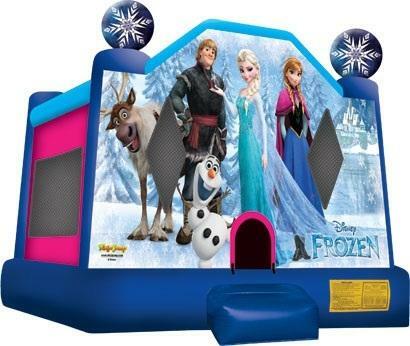 You can party & bounce with Elsa, Anna, Kristoff and Olaf in our exciting new Frozen bouncer rental. This large Jumper feature a spacious 13ft x 13ft bounce area with an inflatable entrance ramp of your guests safety. Also has large netted vent windows to your bouncers cool and allows parents to keep a watchful eye on activities inside. Reserve early for your event to insure availability.